Last week we covered creating ‘day trails’ in Photoshop using the technique in Astrophotography known as ‘star trails’. Today we take the same technique and use it to create a view of city activity at night. 1 x Timelapse System, you can use a simple webcam as per our previous Tutorial: Torch + Webcam = HD Timelapse System a DSLR such as the Canon G9 with CHDK , a iPhone with the free Gorrilacam app or any camera that can take photos at regular intervals. We used a Go Pro HD camera in timelapse mode, taking a picture every 5 seconds. 1 x Copy of Photoshop, you can download a 30 day trial. Time Taken, 4 to 12 hours to capture, 2 to 6 hours to process. The concept is simple, set up your camera, webcam or iphone at a suitable location, and capture an image at regular intervals, for our example we captured an image every 5 seconds pointing at the skyline of London. Capturing an image at least every 5 seconds is vital for star/aircraft trails as it allows for closer spacing between the lights in the final image. The next step is to open up photoshop, chose the images you want to use, and start stacking. 1) Create a new blank black image the same size are your captured photographs. 2) Load the action into the action windows in Photoshop and load the action Startrails.atn. 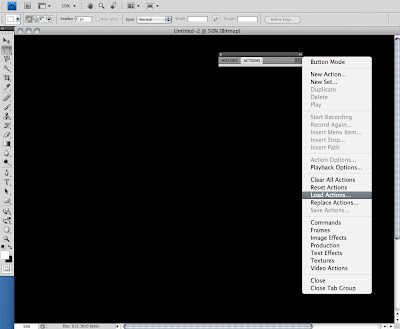 3) In Photoshop click ‘File’, ‘Automate’ and ‘Batch’. Select the action you have just loaded and choose your directory with the images as source and make sure you select ‘None’ for the output directory. The line across the centre is a star and the bright line on the left is the moon coming into shot. 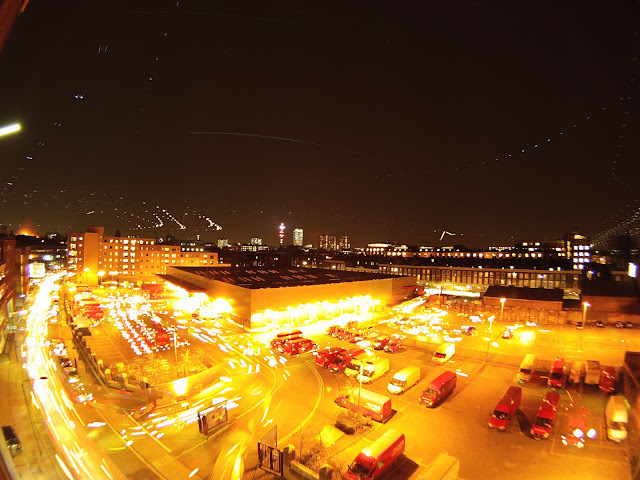 The rest of the lights are aircraft in the sky above London. You can view higher resolution versions via our Flickr Photostream. awesome post! I always love to read your blog post..